Oxford Economics and SAP recently released the report “Workforce 2020: The Looming Talent Crisis” aimed at understanding the opportunities and challenges of the evolving workforce. The research is based on survey responses from over 2,700 executives and more than 2,700 employees in 27 countries. Understanding the core characteristics of “the new face of work,” as SAP puts it, is an important step in recognizing the opportunities and challenges that will come with it. SAP and Oxford Economics’ research identifies several key characteristics of the 2020 workforce, including that it will be an increasingly flexible one. Of executives surveyed, 83% cited that they plan to increase use of contingent, intermittent, or consultant employees in the next three years and 58% say that this requires changing HR policy. In addition to being flexible, the 2020 workforce will be increasingly diverse, and SAP advises that because of this HR leaders will need to become more evidence-based to deal with these realities. As of now, only 50% of HR departments state that they use quantifiable metrics and benchmarking in workforce development and only 47% say they know how to extract meaningful insights from the data available to them. This is likely part of what influences the reported lack of progress towards meeting workforce goals that many executives cite. Just 33% stated that they have made “good” or “significant” progress towards workforce goals. SAP identifies technology as a key need for the evolving workforce that organizations are unprepared for. While this may seem obvious, in the U.S. just 39% of employees report getting ample training on workplace technology and only 27% report access to the latest technology. While it’s understandable that not all organizations can offer the most cutting edge technologies, a lack of sufficient training for the technologies that are in place could be seriously affecting employee productivity. Aside from technology, misconceptions about Millennials are another trend of the evolving workforce that SAP points out (and with the expectation that this generation will make up more than 50% of the workforce by 2020, any misconceptions are noteworthy). The research points out that while Millennials are different than other generations, they may not be as different as they are typically portrayed. According to executives surveyed, 60% believe Millennials are frustrated with manager quality but only 18% of Millennials say that they actually are. Additionally, 62% of executives report that Millennials will consider leaving their job due to a lack of learning and development, but just 31% of Millennials say they have considered this. In terms of the emerging workforce, there may also be gaps between what companies believe employees want from them and what employees actually want. Perhaps not surprisingly, the most important incentive to U.S employees is competitive compensation (84%) followed by retirement plans (75%), and vacation time (62%). 39% of employees say higher compensation would increase loyalty and engagement with their current job. When it comes to attributes that employees think are most important to their employer, job performance and results is number one (46%), followed by the ability to learn and be trained quickly (29%), and loyalty and long-term commitment to the company (28%). This differs however, from what employers deem most important. The top three attributes executives want in employees are a high level of education and/or institutional training (33%), loyalty and long-term commitment 32%), and the ability to learn and be trained quickly (31%). What executives and employees do agree on is that organizations are not focused enough on developing future leaders. Only 51% of U.S. executives say their company plans for succession and continuity in key roles and 47% say their plans for growth are being hampered by lack of access to the right leaders. Employees agree that leadership is a problem area, with just 51% of employees stating that leadership at their company is equipped to lead the company to success. Better learning and education opportunities will be key to bridging this talent gap. The need for technology skills in particular will increase in demand (e.g. cloud and analytics), although SAP’s data states that just 33% of employees expect to be proficient in cloud in three years. This statistic is slightly better when it comes to analytics, with 43% expecting proficiency in three years and almost 50% expecting proficiency in mobile, social media, and social collaboration. 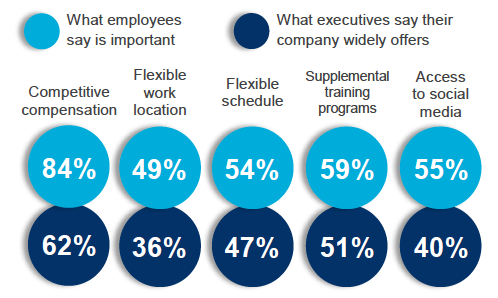 In terms of training programs, only about half (51%) of American executives say their company widely offers supplemental training programs to develop new skills. This aligns with employees’ perceptions toward training, with 51% reporting that their company provides the right tools to help them grow and improve job performance. Additionally, about half (52%) of employees say their company encourages continuing education and training to further career development. Take a look at the graphic below that highlights the five major labor market shifts discussed. Are you beginning to think about shifting workforce development strategies for the future? Are you really sure what your employees think? Or are you making assumptions based on popular press reports that may not be founded on fact? Approximately 80 million Millennials live in the U.S today. In my last post on Talent Acquisition Trends I touched on the fact that this group is the largest generation in history and, while the exact percentages vary depending on the research, is expected to make up more than 50% of the workforce by 2020. We may still think of Millennials as “the next generation” but the fact is that this group will make up the majority of the workforce in the not too distant future, so research on the values and expectations of this generation is valuable – and actionable. 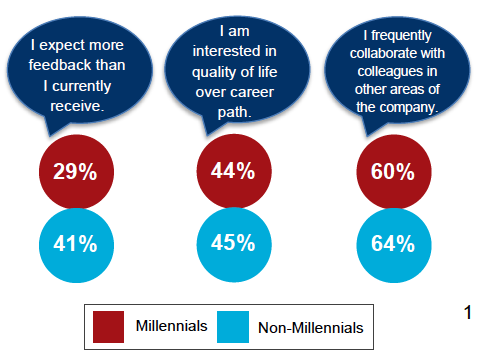 A great example of this kind of research is the “2014 Millennial Impact Report: Inspiring the Next Generation Workforce” by Achieve, whose purpose for the research is to “Understand Millennials’ preferences for cause work and to share those findings with organizations that are looking to better engage this influential group.” Surveys were distributed to Millennial employees of corporate research partners from various industries, as well as a generic survey with respondents representing more than 300 companies and organizations across the United States. For the study, Millennials were defined as individuals born after 1979. As I’ve discussed in previous posts, Millennials place a high value on corporate social responsibility. Achieve’s research looks specifically at the role “cause work” plays in motivating Millennials overall – from job search, application, through to employment. Consider that of the Millennial employees surveyed, 92% felt they were actively contributing to a company having a positive effect on the world. Where cause work starts motivating Millennials though, may differ a bit from our assumptions. Of those surveyed, 63% of Millennials said that a company’s involvement with cause work and community initiatives did not factor into the search that resulted in their current job! This contradicts the common assumption that cause work matters from the beginning of a Millennial’s job search. Achieve discovered that, in fact, most Millennials first looked at what a company does, as well as pay and benefits, when deciding whether or not to apply. Cause work was not a significant factor. While only 39% of Millennials reported their company discussed cause work during the interview process, the companies that did do this, influenced interviewee’s decisions. Of the Millennials who heard about cause work in the interview, 55% of them said the company’s involvement with causes helped persuade them to take the job. Bottom line: mention cause work in interviews – especially with Millennial candidates! Another trend that I have previously discussed is Millennials’ relationships in the workplace, specifically that Millennials have a tendency to build close friendships and desire to work with those they know and would be friends with outside of work. This desire also presents itself in Millennials’ preferences for company-sponsored volunteer projects/programs. Of the Millennials surveyed, 77% preferred to perform cause work with groups of fellow employees as opposed to doing independent service projects. More specifically, 62% of Millennial employees preferred volunteering and doing cause work with employees in their same department rather than employees in the company they didn’t directly work with. For Millennials, relationships also play an important part in informing candidates about a company’s causes. Information from past and current employees was the third most common source for Millennial employees who researched their company’s cause work (36%). The most common source of information was the company’s website (93%), followed by Google Search (61%). These top three sources, including word-of-mouth, beat social media outlets Facebook (22%), LinkedIn (12%) and Twitter (11%). One last interesting area of commentary from Achieve’s report is how Millennials view the assets they can potentially donate. As it’s put in the study: Millennials differ from previous generations in that they “may still give money, time and skills, but they also view their network and voice as two very beneficial assets they can offer a cause. For Millennials, all of these resources are equal in how they may help a cause. A Millennial may see Tweeting about a cause as a way of giving resources, because they are donating their network.” When it comes to giving, Millennial employees donate money to nonprofits both on their own and through their company’s promoted giving campaigns, and they donate generously! Only 13% of the Millennials surveyed did not donate money to nonprofit organizations in 2013. This report tells us that Millennials consistently defy employers’ expectations along a broad continuum. We need to pay attention, continue to ask questions, and learn to meet them on their own ground. Who would have thought that company websites and Google searches would be far more powerful (and motivating) than social media in this aspect of job search behavior in the Millennial cohort? And it’s interesting to note that camaraderie in their workgroup – not in their employer in general – is motivating for them. That’s one piece of data that is consistent with what we know about all cohorts in the workplace: we all want to trust our leaders, have pride in our work, and camaraderie within our workgroups. Great Place to Work has been validating these data points for more than 20 years.